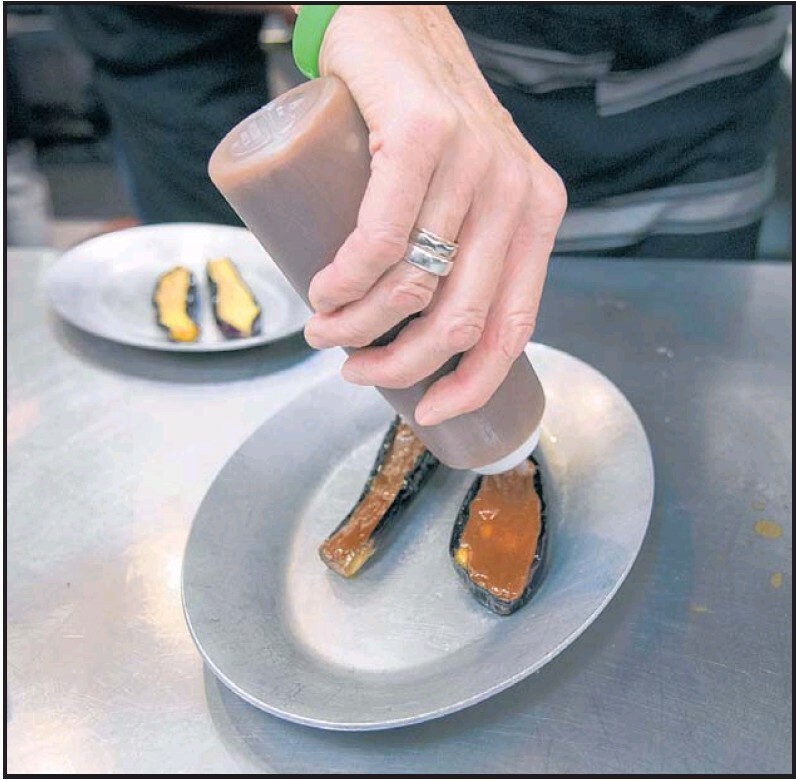 A savory-sweet miso sauce is spread on fried halves of Japanese eggplants, then broiled to golden perfection. Heat oven to broil. Line a baking sheet with paper towels; set aside. In a large heavy-bottomed saucepan, heat 2 inches of oil to 360 degrees. Working in batches, place eggplants in pan, skin side up, and fry 1 minute. Turn and fry 30 seconds more. Transfer eggplants to baking sheet and let drain. Transfer eggplants, skin side down, to an unlined baking sheet. Spread each half with slightly more than 1 tablespoon miso. Broil until miso begins to darken and caramelize, about 30 seconds to a few minutes, depending on the strength of your broiler. Sprinkle with sesame seeds and garnish with pickled ginger and plums. Combine miso and sugar in a medium heavy-bottomed saucepan. Add sake and mirin, whisking to combine. Bring to a simmer over low heat and cook, stirring frequently, until sugar is dissolved and color begins to darken, 30 to 45 minutes. Remove from heat. Note: Den miso can be made 3 days ahead, cooled completely, and refrigerated. Japanese cuisine features pickled vegetables (tsukemono) — especially cabbage, Japanese turnip (daikon) and eggplant. Japanese pickles, collectively called oshinko, are lightly pickled or salted, and some have a sweet taste. Cut small eggplant in fourths after slicing off the stem. If a larger eggplant is used, cut into finger-sized pieces. Soak in water and salt for an hour or two to soften a bit. Drain and put into a crock or bowl. Mix all other ingredients into a paste and pour over eggplant. Turn or cover all the eggplant. Cover and refrigerate for three hours, turning once or twice.